How are you? Without a classroom? How are you? I’m fine! I’m good! It’s weird, It’s different. But I’m good. They look happy. They look worried. They look excited. They look nervous. "I've missed this place." she says, shaking her head with joy. 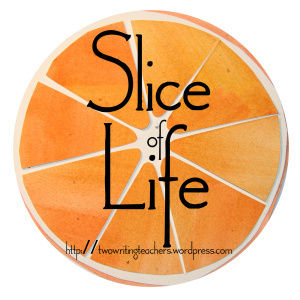 I spend my days popping in and out, slices accumulating in my tired brain…. A second grader looks at me with utter confusion, each word emphasized with a furrowed brow. A kindergartner makes plans for catching the gingerbread man who got away today. "I have a cage. I can build a security camera." A fourth grader says "Can you help me spell division?" and then in almost a whisper, "Are you H. Thought's mom? I'm Abby from school. I started a new school now." I don't really know him yet, but I love him. What was remarkable about your day? I’m noticing and celebrating all the remarkable things this week. And, if you’ve ever spent a day (or an hour really) with teachers getting ready for the school year… you’ll know the definition of remarkable. Quick! Go thank a teacher, any teacher. If you need to find a teacher, look for the people at target, looking tired, but still loading their carts with school supplies before they go back to school this weekend. Love this quote that came in my inbox today. . . The other day I overheard someone else use the word tricky to describe him. They hadn’t met him yet, but it was my fault because sometimes I have labeled him “tricky” in order to try to describe him to others. But I think I’ve been using the wrong word. It’s not that he’s never mischievous… it’s just that that isn’t what I mean by tricky. The nuance of what I mean is lost in the translation from my brain to others’ ears. I mean unique. I mean not interested in the status quo. I mean challenges you to be a better person. I mean sensitive but not quiet. The other day, Mr. Thought and I were talking about how to make sure our son starts off his new school on the right foot. I don’t usually speak in hashtags, but come on. This is #truth. So, I have a new way to talk about my amazing kid. He is fueled by love. He deserves it. And I think I have new way to talk about all kids, right? Who isn’t fueled by love? Who doesn’t deserve it? What does it mean? It means give every kid the benefit of the doubt, set kind limits, give second chances, again and again. Take a deep breath, let it go. Don’t make compliance your learning goal. Look around at your students and get to know them. Please. They are fueled by love. There’s only one register open at Wegmans, and it’s a little bit slow. E and I can handle it though, and while we wait, a pregnant mother of 3 kids pulls her cart behind me. Her toddler keeps throwing things on the floor. So, when it’s my turn to put groceries on the belt, I ask her if she wants to go in front of me. The cashier rings up my groceries, and the woman has to start loading hers. I’m pulled out of my noticing by the cashier complaining about the line. She needs a price check for one of my items, so now she is the only cashier and her lamp is blinking. Another worker walks by, and my cashier yells after her. The cashier grumbles to me some more, and I don’t really know what to say, so I just tell her that it must be so hard. The manager walks over, a smile on her face, asking what she can do to help me. “I’m the only one on register.” the cashier says as the manager walks away, looking for the price we need. When she gets back, she asks the cashier if the item got on my order. The manager checks that the item is now on my order, turns to the cashier and talks in a very patient voice, “More people are coming on. It will be okay.” She walks away. “I hope your day gets better.” I tell the cashier as I walk away. E looks at me, eyes wide and rolling a little. It’s the look he gives me when we witness something a little odd. So, we talk a little about how hard it must be to be the only cashier, and how hard it must be to be the manager trying to get other people on the registers. In my head I think about how patient the manager was, and how stressed out the cashier was. I wonder if this was supposed to teach me something. Is it ironic that the manager was all smiles to me, and on the patronizing side of patient with her employee? I don’t know. But, I noticed. I was just stopping by, a quick summer visit. Camp was in session. I am not a part of the camp. I was just stopping by. A quick meeting or two. I’m just stopping by. I’m just here for a couple of meetings. I’m not involved. A camp counselor came out of a door at the other side of the hallway, and she called out “Mark! Mark! Where are you going?” (Names have been changed, of course.) He said nothing, just wandered further away, closer to the outside doors. “Get back here, Mark! Where’s your counselor? Where are you supposed to be? Upstairs? Come here. You need to find your teacher. Does she know you are here? You have to come here.” She kept repeating these kinds of statements, then said something I couldn’t understand, and walked back into her room for a moment. Mark just kept walking, almost out the door. “No! Are you with him?” the counselor asked me, and I started to wonder… who is with this boy? Mark walked back, as the counselor walked away and up the stairs. I watched him, but he didn’t follow. He walked slowly towards the outside doors down the other hallway. I easily caught up to him. We talked a bit, and as I was convincing him to not go outside until he found his counselor, another woman rounded the corner. “He thinks he lost his lunchbox outside.” I explained. But wow, I would really like to know the rest of this story, the rest of his story, and if there was a lunchbox out on the playground.